As an American that has transplanted to the United Kingdom, I’m reminded on a daily basis of the history that surrounds me. I’m fortunate enough to live very near Windsor Castle, the home of Queen Elizabeth, and my house, believe it or not, was built in 1649. If you are going to do the whole EXPAT thing, do it properly I say. Part of living in the UK is the monarchy. Like, love it or hate it, it is very much a part of English life (I’m not here to debate its merits peeps… this is an app review). For those who are interested in learning a bit more on the modern history of the United Kingdom monarchy, take a look at the UK Monarchs app for Windows Phone. This simple app gives you the history of every monarch from 1707 through to today with multiple different ways to view this information – from House to timeline. It’s a free app and well worth it for you history and monarch buffs out there. Wikipedia. Yes you can go to Wikipedia and find this exactly same content because that’s exactly what this app does for you. 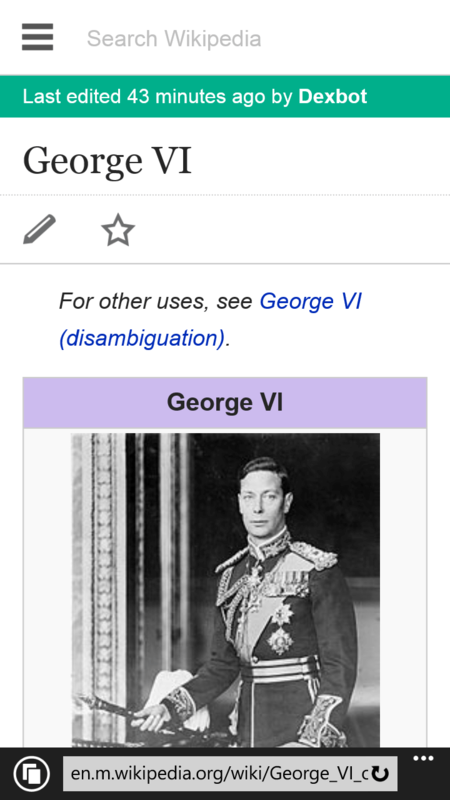 You tap on a monarch and Wikipedia is opened. Some people don’t like these apps but so long as the developer isn’t charging for it, I have no problem with them wrapping up content already out there. Why re-invent the wheel? In the case of this app, the developer is very clear and open in the Info section what this app does. There is no mystery. When you open the UK Monarchs app you are taken to the House view. 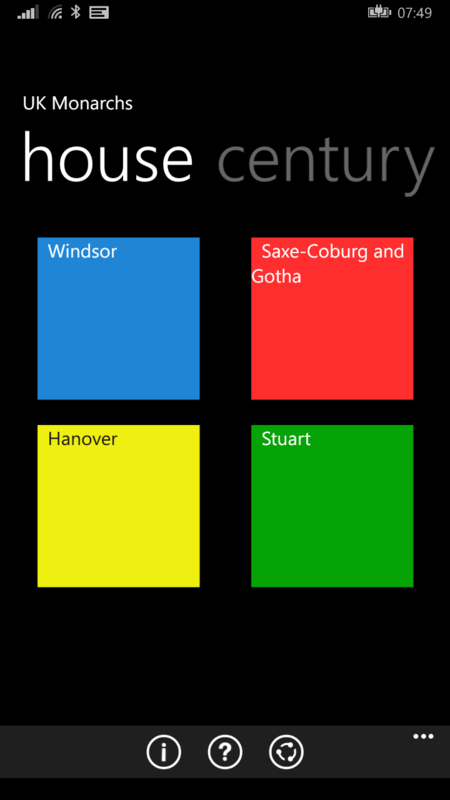 Here you see the four houses that have made of the UK monarch since 1707: Stuart, Hanover, Sax-Coburg and Gotha and the current House of Windsor. Tapping on one of the houses will bring you to a list of the monarchs from that house that have been king or queen in the UK and the time they were the monarch. Within the UK Monarchs app you can also view by century or by a historical timeline which will allow you to see each monarch in the order which the reigned. If you aren’t sure where George III is in relation to Queen Victoria, this is a great way to get the order of the monarchs straight. As I said before and as the app clearly points out, when you tap on a monarch to view their information page, you are taken to Internet Explorer to the Wikipedia page for that particular monarch. It goes to the mobile version of Wikipedia so it makes navigation on your Windows Phone easy. There you can read all of the historical information about the monarch you have selected. Once you are done, tap the Back button on your phone and you are returned to the UK Monarch app. If there is one thing I wish the UK Monarch app did was go back a bit further in history. I appreciate the goal of the app is to provide the modern monarchy information but as a history buff (certainly not an expert) I could find an app like this really helpful in learning about William the Conqueror or Charles II, etc. Be that as it may, this app does a great job of making this information easy to find and digest. The UK Monarchs app for Windows Phone requires Windows Phone 7.5 or higher and you do need to have data connectivity for the app to work properly. The app is free.